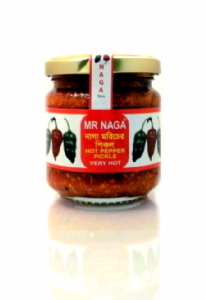 Very Hot Indian pickle made with Naga Chilli, also used as a cooking paste for adding flavour and extreme heat. Naga Chillies give this pepper sauce a unique fragrant hot flavour. If you like EXTREMELY HOT Indian pickles you will like this. 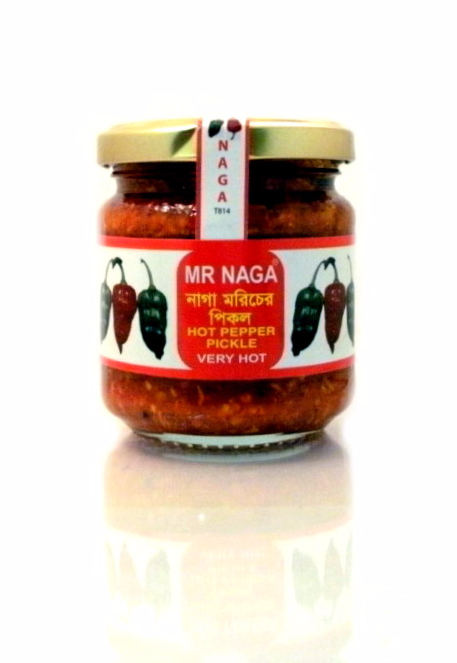 Made with one of the hottest chillies in the world - NAGA - it is only for those that like it HOT! IMPORTANT: Due to its unique recipe, Mr Naga is prone to leak during transit however well we package it. Please be aware of this before placing an order. It will be perfectly fine to use. Ingredients: naga chilli, salt, vinegar, vegetable oil, spices. 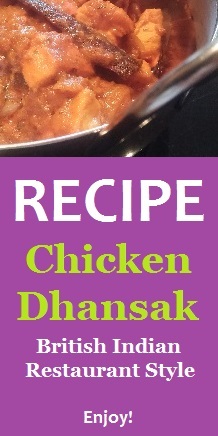 Tried this at a friend'sas an addition to a milder curry and it's amazing, so hot and s great flavour. Now ordered 4 pots! I have tried many different chilli sauces in my time and none can match the delicious flavour, searing intensity and perfect fragrance of this example. One for the spice lovers. The best Chilli paste I've ever tried. It has the best flavour of anything else and the heat level is ideal .... for me.